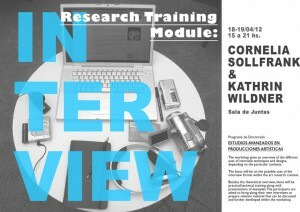 The workshop gives an insight into different interview techniques and designs focussing on possible uses within the art research context. Besides the theoretical overview, there is practical training along with presentations of examples. The participants are asked to bring along their own interviews or prepare relevant material that can be discussed and further developed within the workshop. Knowledge Leaks offers research training modules specializing in the needs of art and design researchers in PhD programs at art schools.